Sugar Beach is as sweet as it sounds. Right across the water from the Redpath Sugar Refinery, this little piece of heaven is my favourite place to go on a sunny day. Just at the foot of Lower Jarvis St. and close to the St. Lawrence Market, Sugar Beach couldn’t be an easier escape for downtown dwellers. Built on the surface of a former parking lot, this public urban beach opened in 2010. 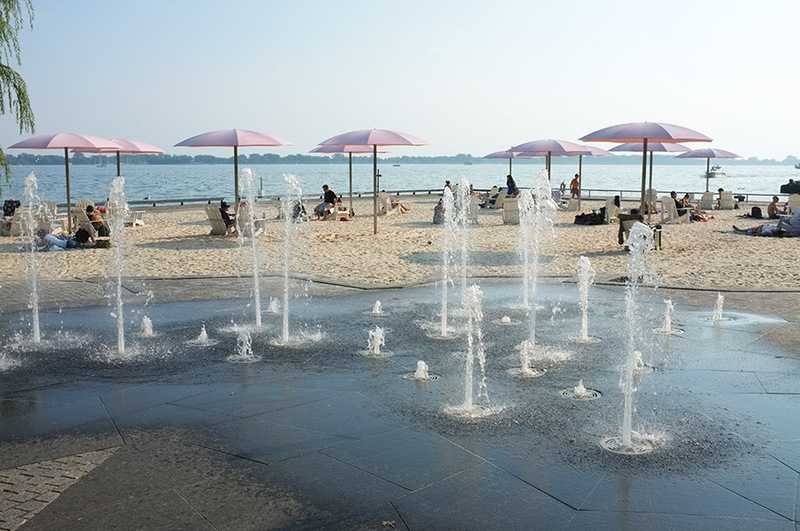 The sand has thicker grains to prevent it from blowing away and the metal pink umbrellas shade white Muskoka chairs. There’s also a water feature that squirts water unpredictably, provoking shrieks of delight from kids and even adults who step in to cool off. I’ve never seen Sugar Beach excessively crowded but it’s not entirely perfect. The biggest drawback is that it’s not a beach you can swim at. It’s on a raised pier and the surrounding water isn’t particularly clean. There are no washrooms, either, although the Queens Quay Loblaws is just across the street (a great spot to grab lunch). 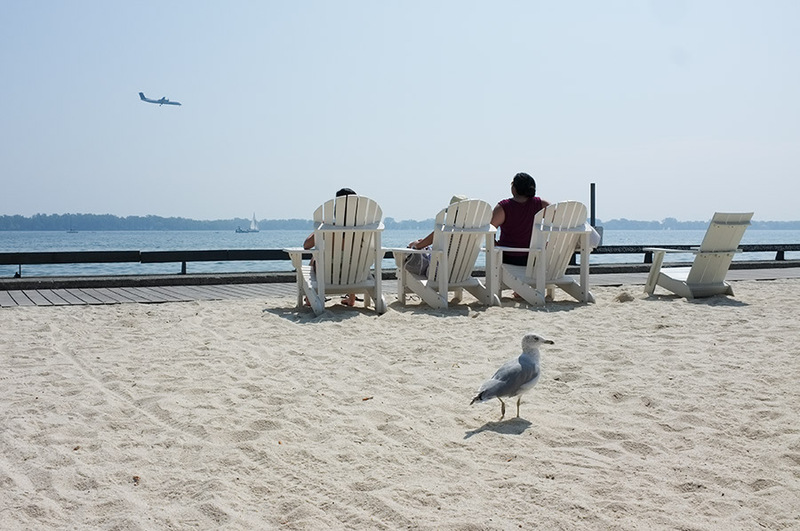 Every few minutes, you also get the roar of the propeller planes landing at the Toronto City Airport and whether you like electronic music or not, you’ll hear it blasting from Cabana, a pool bar across the harbour. However, despite its few shortcomings, there’s no place I’d rather be on a beautiful afternoon. Bright beach essentials: Towel: Hudson’s Bay. 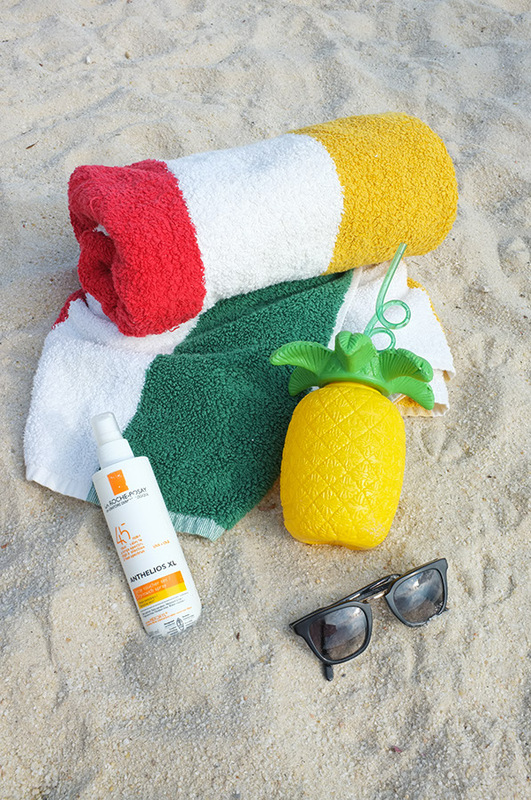 Sunscreen: LaRoche-Posay. Sunglasses: Cutler & Gross. Tumbler: Krazy Straw from Urban Outfitters.